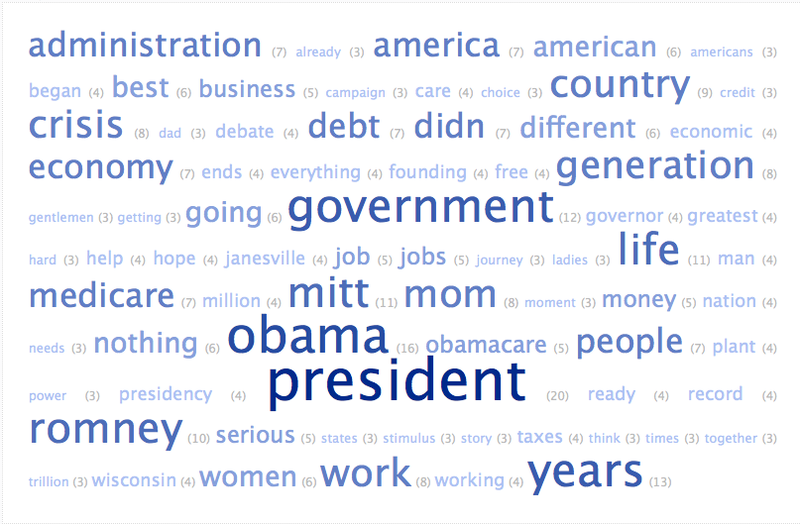 Sometimes it helps to visualize speeches, not just listen to them, to see which words a speaker uses over and over. 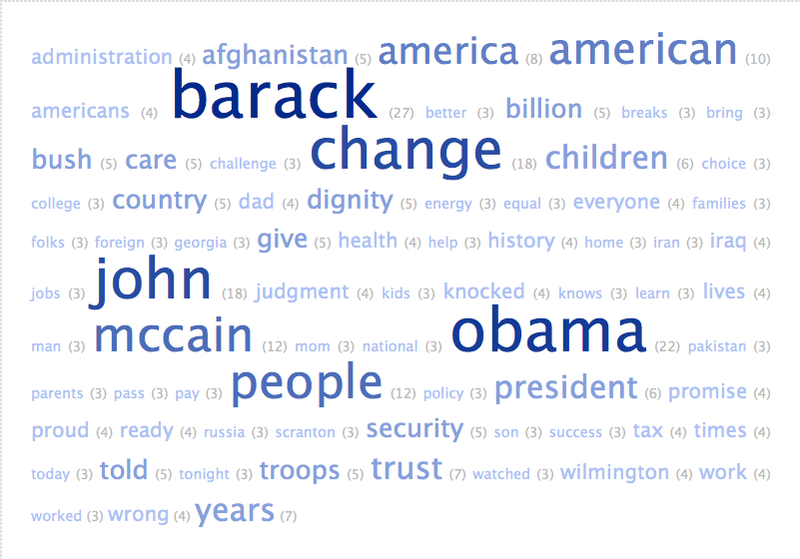 One way to understand the context of a speech is to map the words from the text in a “tag cloud.” So I created these displays which show the most used words in larger font. 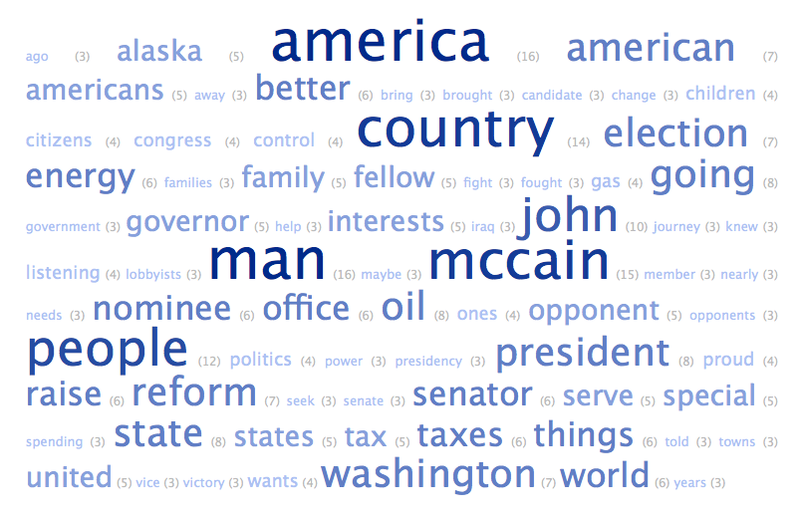 We plug in the exact text of the speech so you can see the number of times each key word is used. Ryan mentioned his mother eight times, mentioned America(s) 16 times and hit the words “crisis” and “debt” over and over. He pounded away on Medicare and mentioned Obamacare five times. The words work and working came up 12 times and emerged as one of his major themes-getting the country back to work. Four years ago, Joe Biden mentioned Afghanistan five times in his Vice Presidential acceptance speech. He also used words like “security,” “troops,” and “trust.” But Biden’s linchpin word was “change.” That is common word for challengers to use in political stump speeches when their party is not in office, as was the case for Biden and Obama in 2008. At the time of her nomination, Americans barely knew Alaska Governor Sarah Palin. The governor stayed away from the war in her speech, but used the word “oil” eight times and “energy” six times. Looking back at those speeches four years ago, it is most striking that the words “jobs,” “recession,” “bailout,” “Medicare,” and “health care reform” were not mentioned in these keynotes. It does give one pause to wonder what words will be top-of-mind hot issues in 2016 that we are not thinking about today.